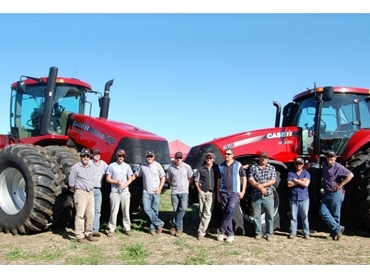 Case IH launched its new flagship Magnum and Steiger tractors with a number of Ride and Drive days across the country, receiving an extremely positive customer response. According to Kerry McCauley, Marketing Manager at Case IH, the new tractors are not simply an upgrade. The tractors are at least 60 per cent brand new. The tractors feature powerful, fuel efficient engines that are comparatively cheaper to own and maintain. The tractors have been designed to offer increased power, productivity and operator comfort. Both the Magnum and Steiger models have also received some significant cosmetic changes and, uniquely for tractors of this size, feature optional cab suspension and deluxe air seating for a more comfortable ride. The new Magnum and Steiger tractors have been tested for fuel efficiency by Nebraska Tractor Test Lab. According to preliminary results these tractors offer up to six per cent more drawbar horsepower and up to 12 per cent more fuel efficiency in comparison to competitors machines. Local Case IH dealerships can give further information on the new tractors as well as details about future Ride and Drive days.